This Month for EOG Book Club our genre was YA or Teen Lit. This gave me the opportunity to dive back into the rather entertaining Divergent series by Veronica Roth. 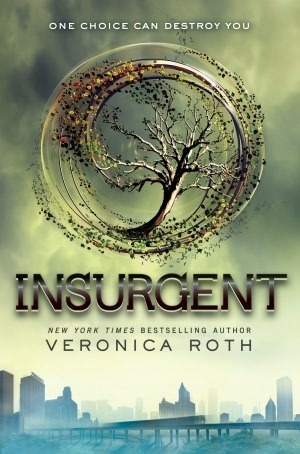 I read the first book, aptly named Divergent shortly after it came out, and found myself enjoying it. Sadly that meant waiting nearly a year til I could get my hands on and sink my teeth into the next instalment. As soon as I got it I popped off the dust jacket (I never read with them on, I’m always scared I am going to ruin it!!) and nested down with my new read. I was very confused! I read the opening chapter and found myself remembering nothing. I recognized one name, the setting of factions and the city, but otherwise found myself drowning in a sea of unfamiliar names. So I popped it on my shelf and picked up the first book for a quick reread before my glorious adventure onwards and upwards. Ripping through a book a second time is pretty simple. You remember large chunks and have the option of skipping over parts that are familiar or rereading chunks that baffled you the first time with the benefit of whole book context. It took me til about the middle of the first book to start remembering who everyone was and how they all fit into the first chapter of the second book. The confusion only aided by the fact that several key characters change their names at one point or another. But I got the gist and was back on my way. If for some reason you are unable to fit or function into any of the factions you are doomed to a life of the factionless, second rate citizens with few rights and no wealth. When children turn 16 they take a simulation exam to determine which faction they are most suited for and help them choose which faction to be a part of for the rest of their life, faction over family. Leaving your old faction means cutting all ties. When our lead character Tris goes for her test she finds that she has an aptitude for 3 factions and the ability to control the simulations. This labels her the danger and unspoken title of Divergent. And when she chooses to leave her life of selflessness for a world of danger, bravery and ruthlessness she finds theres more behind being Dauntless then she ever imagined. Insurgent picks up quite literally right where Divergent left off. No great span of time has passed its only moments later. Tris and Four, she calls him Tobias which is his given name (and one of the reasons the first chapter threw me off) must escape the fallen Dauntless and Abignation districts of the city along with Four’s father Marcus, Tris’s brother Caleb and the ever hateful Peter. They flee with other Abignation to the Amnity compound and seek refuge from the power hungry Euridite. The book chronicles the movement of Tris and Four as they attempt to save what Abignation is left and muster the forces of Dauntless to retake their city. I honestly cant say a whole lot more about plot without giving away some key events that really make or break the story, I will however give my thoughts on how it was done. Veronica Roth does a spectacular and delicate job of handing suicide. We loose someone in the first book to suicide and in Dauntless they are exalted as a hero and truly Dauntless, for having been brave enough to take on the final adventure into the unknown. By so parading something we know to be so blatantly untrue she is able to tackle the idea without trivializing it and alienating people who might have had the same thoughts. She shows suicide as the tragedy it truly is and I applaud her for it. Suicide pops up again in the second book but we see it in another of its forms. Not as the overt taking of ones life, but as acting foolishly and recklessly with no regard for their own life, putting themselves purposely in harms way. It is all too common, but under recognized in a lot of cases. By highlighting it in the way she does, showing the danger and impact it has on others, Roth is again able to call out such behaviour for what it is without becoming preachy or condescending. The idea that we are more then one dimensional is also tackled in the innovative idea of factions and separation of people for what is considered their key characteristics. This is most prevalent in the writing of the main character Tris, who has an aptitude for 3 different factions and gives her the label of divergent. But it can also be seen in all of the transfers as well. Al, while from Candor shows he can be brave by excepting to join a faction he has no desire for, as well as being selfless in his throwing fights so as not to hurt the other transfers. Christine who is also from Candor never looses her propensity to tell the truth, but her strength and desire for adventure pegs her as Dauntless. Even Peter, who we love to hate, shows signs of his Euridite past along side his violent Dauntless tendencies. I also have two problems with the books thus far, but they create spoilers. So read beyond the cutline at your own risk. For those who don’t and do read on, let me say this. The Divergent series has proven to be a very good series thus far. I have enjoyed it immensely. It is a YA title which I know is likely to throw people off but it really shouldn’t. Its not the next great American novel by any means, but it hits on some really important points that more then just teenagers need to hear. Its not quite brain candy with all the serious themes riddled throughout, but it is written in an easy to read style that will have you whipping through it in a couple of days. This is my pretend cutline because WordPress won’t do it for me! In the first book we learn through Tris’s fear landscape and just her general personality that she does not do intimacy well. Touching and physical affection is just not something that people in Abignation are taught or are generally exposed to. We get one brief and awkward scene of Tris and Four talking about it and it all seems to just disappear. Suddenly kissing and making out and touching half naked Four is no longer an issue. I get that the fear landscape helped her to face that fear, but it doesn’t make a fear go away. She goes from being shy and uneasy around Four to having zero qualms about getting all up in his grill and being super touchy. The transformation for me was far too fast and therefore left it feeling unrealistic. Where You Go I May Not Follow Blog at WordPress.com.